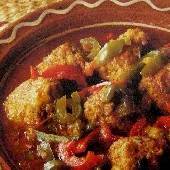 The meatballs in this recipe for Meatballs in Sauce with Peppers aren’t just made with ground beef (hamburger meat)… they include eggplant! A fabulous tomato sauce with red and green peppers adds to the delightful taste combination. Serve with rice. In a bowl, knead together ground beef, grated onion, grated eggplant, bread (torn apart into small pieces), mint, egg, ouzo, olive oil, salt, and pepper to make the meatball mixture. Adding a little water will help make the meatballs lighter, but it’s optional. Form into round meatballs and fry in oil until nicely browned and crisp all around. 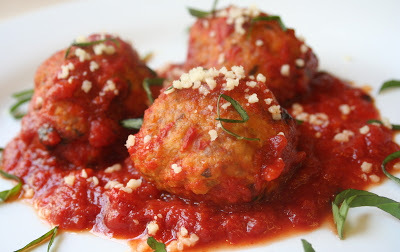 Meatball Tips: Do not over-knead the meatball mixture or they will become too dense. The oil for frying should come to about the middle of the meatballs so they only need to be turned once. 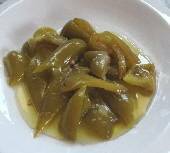 Heat the oil in a pan and sauté the peppers and onion until the peppers wilt. Add tomatoes, paprika, salt and pepper to taste, and 1/2 cup of water. Bring to a boil then reduce heat and simmer (slow boil) for 6 minutes. Add the meatballs to the sauce and when slow boil resumes, cook for about 15 minutes. 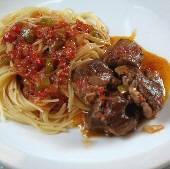 Meatballs in Sauce with Peppers is usually served with rice, but also works well with noodles or mashed potatoes.